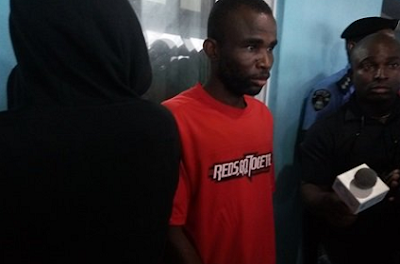 The police in Bayelsa State have arrested a 47-year-old man, Moses Otimba, for impregnating his wife’s younger sister, Joy Mathew, and killing the male child five days after birth. Otimba was said to have asphyxiated the child to death and buried him in a shallow grave at a river bank. The suspect, an indigene of Ogbogoro community in Yenagoa Local Government Area of the state, reportedly executed the devilish act in connivance with the 19-year-old girl. The two suspects were paraded on Thursday by the Commissioner of Police, Bayelsa State Command, Mr. Asuquo Amba, at the command’s headquarters in Yenagoa, the state capital. Amba said policemen from Yenagoa Police Division arrested the suspects, who confessed to the murder. The commissioner said: ”Mr. Moses Otimba, male, 47, impregnated one Joy Matthew, 18, a younger sister to his wife, Glory. The pregnant Joy was delivered of the baby by a traditional birth attendant at Amarata, Yenagoa on May 8, 2017. Amba said Joy, who claimed to be under the influence of ”some spirits”, disclosed the incident to her mother three months after the act. He said angered by the development, Joy’s mother reported the matter to the police, which swung into action and arrested the suspects. Amba said: ”The police visited the scene of the incident. By the time they got to the scene, the current of the river had washed off the child’s body. Otimba, in his confessional statement said he killed the baby boy because he was ashamed to tell his wife (Glory) and his mother-in-law. He admitted killing the baby with the consent of Joy, after discussing his predicament with her. Otimba said: ”I killed the baby boy because I was afraid and scared. I did not really know how to face my wife and my mother-in-law that was why I killed the baby. I am really sorry. ”I took the baby to the bush in my community and closed his nose until he died. When I was carrying out the act, I was weeping and crying but I had no choice. ”When I got to the site, he was five days old then, I closed his nose and within some seconds, he stopped breathing. After that, I started regretting. ”The mother of the baby agreed that we should kill the baby. I told Joy that the situation was precarious for me and that I did not know how to tell my wife about the development.